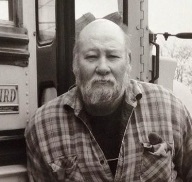 Photograph of Arvel Mosier from the Generation book. Arvel Mosier was Hattie Wright's son. He was born August 23, 1944, in Depauw, Indiana, to Walter and Hattie Mosier and died Wednesday, July 23, 2014. "We had a very long talk, maybe about three hours, and he was telling me all about setting up this large tent revivial. At the time, I was driving a truck for the rock quarry, and he said to me, "By the time you come back from the Army, I'll have this all set up. Now, it is going to take one trailer truck to haul the chairs, another trailer truck to haul the tent, and it will take another trailer truck to haul the supplies." And he said, "Would you be interested in being one of my truck drivers?" He said, "There will be a lot of setup work." Arvel was one of the two children whose mother Hattie Wright had been listening to William Branham and said, "That's nothing but the truth." Arvel's retelling of this story is not that exciting, and does not disclose to what story his mother said, "That's nothing but the truth". "Then Mother, who had been listening real close, said, "That's nothing but the truth." "The next thing you know, he told Mother to ask for anything she wanted, anything in the world. And I can remember her saying that she wanted the salvation of her two boys. Later, we were baptized at the Tabernacle. I was 15 years old." William Branham's version of the story includes a few extra facts. Hattie Wright response was to his story of creating squirrels. The boys fell on their knees instantly. None of these things are mentioned in Arvel's version. "Hattie Wright, she, I guess she's here this morning, sitting right there. She was the first one, when we seen those squirrels; and she knowed the commission about that, and when them seven straight times that God created something. I said, "That's the same God that could create a ram for Abraham, to convince him of his commission; is the same God that can create a squirrel, because that's what I had need of." Little ol' Hattie Wright there, sitting in the back of the building. With her heart off the things of the world, she was believing. She said, "Brother Branham, that's nothing but the truth." "And little ol' Hattie setting back there, said, "Brother Branham, that's nothing but the Truth!" ...I said, "Sister Hattie, THUS SAITH THE LORD, you said the right word like the Syrophenician woman said. The Holy Spirit's speaking to me now, and said for me to give you the desire of your heart." ...Her boys had got to be regular 'Ricky's,' school days, you know, and just sassing their mother; and fifteen, sixteen years old. And, oh, they were standing over there laughing at what I was saying. ...She said, "Brother Branham, the greatest desire in my heart is the salvation of my two boys." ...I said, "I give you your boys, in the Name of Jesus Christ." And them snickering, laughing, fun making boys fell across their mother's lap, and surrendered their life to God, and was filled with the Holy Ghost right there. Why? That is Truth! God has the authority to kill me, before these people across the nation. William Branham died less than a month after this last statement. ↑ William Branham, September 11, 1960, As I was with Moses. ↑ William Branham, November 27, 1965, I have heard but now I see. This page was last edited on 22 August 2015, at 05:34.